We were so crazy about cement tiles that we almost imported a container from Asia, until I realised the quality is not what we want. Since cement tiles are so en vogue, also Bisazza has some well-known designers creating beautiful cement tile series. But we could not see any samples, only the online catalogue, and they not only seemed pricy but also a bit too opaque. I almost had given up on antique style cement tiles when someone was telling me in Pizzo that they are renovating an old palazzo and the new owner wanted to get rid of the cement tiles. People have different tastes, right? When I wanted to see them, we learnt that workers had just taken them out the fast way. They were all destroyed and already disposed. Then I announced to my FB friends in Pizzo that I am looking for old tiles and the message got shared. A few days later, I was offered to visit a dark and dusty storage room. The tiles looked interesting, not glamorous, but ok. We did not know how many of the same pattern were in that dark earth hole, and how many were still usable. Look at the photo below! This is now what lays in front of our new entrance at the end of the staircase. It is a bit shiny after washing it with water, but doesn't it look nice? The same pattern in a different size and colour (not as nice as this one) was later offered through a different source, for a different price... I think we got really lucky! antique cement tiles from Pizzo found a new home in Pizzo! We even have one more square meter available that we will lay on the floor of a little bathroom. It is not what we had in mind, but I am so glad to have found something antique, something that gives the new apartment a bit of a special touch. When you come to Southern Italy on holiday you don't want to see what you could get at home or at Ikea, right? With these cement tiles we have recycled something original and local. I am sure our visitors will like a unique flooring. I do! Apart from tiles, we like the experience we have with wooden parquet from Berti. So we decided to repeat the oak wood parquet from the residence for the flooring of the living areas and bedrooms. However, for the kitchens and entrances we prefer tiles instead of wood. And because we could not get cement tiles, but wanted a Mediterranean touch nevertheless, I said let's get Vietri tiles that are beautiful colourful ceramic tiles from a town called Vietri, near Salerno. For the larger kitchen in the dependance (that would be white too) I have chosen 'Valeria' by De Maio (photo below). The star pattern is matching the cement tile 'star' in the entrance (first photo above), the light blue will match the balcony tiles and the Smeg fridge that will be light blue again like the one in the residence. The most beautiful tile probably is the next one! I am very much looking forward to see that laid in the "side" entrance of the dependance, which is a corridor of 14 m2. The blue will match the Bisazza mosaic in the small bathroom, the blue of the relief of the church opposite in the piazza, the sky and the sea. It will look fabulous! From the piazza, the facade looks already as we could move in tomorrow. Deja-vu! We had this with our first project too. When my neighbour brought me flowers to welcome us in the alley, because it looked from the outside like we had moved in, it took us another two years or so to finish the inside! This time, I hope we will be faster! Although we are already one year behind schedule due to - I would call it 'the usual Calabrian obstacles' - we plan to have two apartments ready for rent in May 2016. The project from the outside - with one studio downstairs and the 2 story dependance upstairs. The roof is done, windows and doors are installed. What is still missing are the balustrades for the balconies that we ordered to be crafted according to my design (which is repeating the pattern of the oldest railing of our first project). Maybe I should have ordered some standard wrought iron pattern. Then you know what you get. Let's see. Can't wait to see the facade completed. In our old palazzo we have beautiful cement tiles that we were able to preserve. For our new project we were thinking of having cement tiles too. But the ones we have are no longer produced anywhere. However, as one can observe, another kind of cement tiles are very popular nowadays, especially crazy tile mixes can be seen everywhere. The pattern that are popular are probably Moroccan origin and are very hip in America and Southeast Asia. There are factories in the States and in Spain that produce them, but not in Italy. Since we see them allover in Bangkok (in the newly opened EM Quatier I would say 1/3 of the restaurants use Mediterranean cement tiles and crazy tile mixes) we found a factory here that produces beautiful cement tiles with classic pattern. We went to an architects fair and were in heaven at the BEZZ booth. Should we really import for our project in Italy Mediterranean cement tiles made in Thailand? I was searching for producers in Sicily, but it does not seem that any Italian factory is still specialized in real cement tiles with a good choice of pattern. We were told that cement tiles are so delicate, even more than terracotta tiles, that customers turned to other products, porcelain tiles or wood. Cement tiles need constant care, mainly waxing and special cleaning products. Therefore cement tiles should not be used in wet area, not in bathrooms and even not in kitchens, we were told. When we were in Italy, fake wood was allover the showrooms. It seems very popular and actually looks great. Should we use that in the kitchen? The only Sicilian company that offered products close to what we were looking for never replied to my email inquiry. Probably their hand made tiles would cost us a fortune anyway in comparison to the amazing Thailand tiles that are just 30 Euro per square meter! Sigh, I would really like to support Italian economy and have Sicilian tiles in my Calabrian home. After having visited the fair in Bangkok and having found the factory's showroom and discussing pattern and color, and finding out the amount of sqm we would need, and having confused Angelo about the floor preparation, two weeks later we finally came up with a decision for two patterns. Then a day later, I visited the new EM Quarter in Bangkok and - what a coincidence - most tiles on the new restaurants' floors looked very familiar to me and indeed were by that factory we had discovered. Shockingly, in one restaurant they were in a terrible state. I had seen the same scratches and cracks in the showroom before, but ignored it as I thought it's impossible what I see. These tiles had black marks allover and cracks. Black shoes and moving chairs seemed to leave black scratches. A lot. I went home and told my husband, that I have made a new decision. No imported tiles. It is a total different quality from what we have in our 200 year old house. There must be another quality of tiles that you see allover Pinterest. They are used in shops, in restaurants, in highly frequented area, and they can't be that high maintenance. The Spanish factory is about three times the price and probably delivers more durable quality than the Thai production. But I need to see tiles and touch them before I can order. I have nothing to do with Spain. Thailand was just an option since we live here. Why can't an Italian company just jump in and pick up the trend? But wait! Bisazza does now cement tiles! They are not the joyful elaborated Moroccan patterns and colors we were looking for. 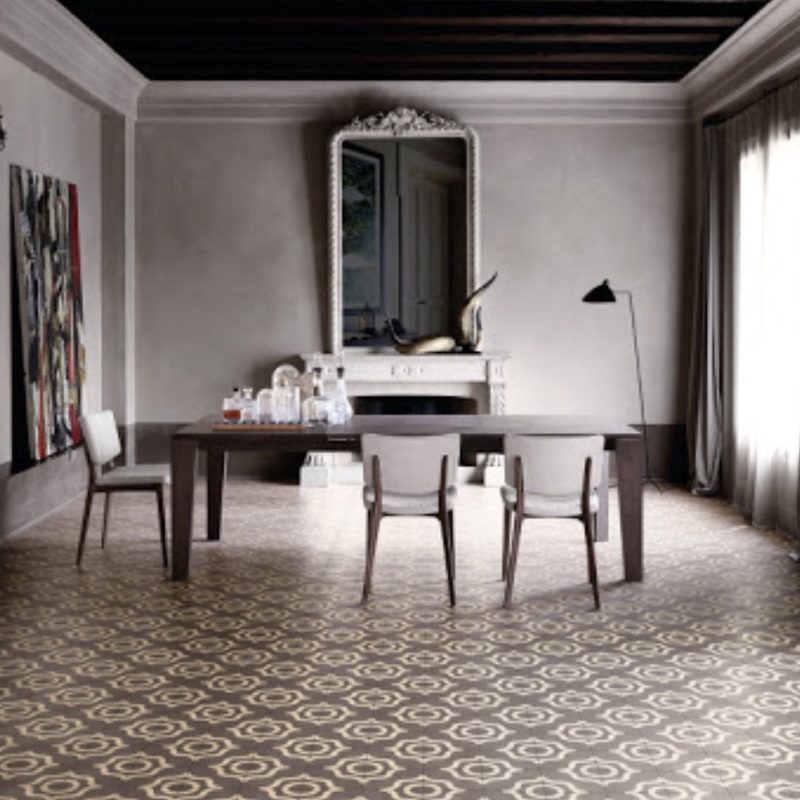 Bisazza's tiles have larger scale geometrical designs and mainly opaque colors. Cement tiles with a modern twist. And very Italian! Maybe we should stress the budget for those Bisazza tiles?! I can't believe we are back to zero. Feeling kind of disappointed if we would go for the good old oak panels. At least that kind of floor would not distract from the stunning sea views! ﻿My Italian family likes to stroll antique markets and browse antique shops. Variety and prices are more attractive in Italy than in Germany. The latest find of my mother-in-law in Northern Italy is this old wrought iron chandelier that used to have a gas supply in the center of the lamp. My father in law modified the gas lamp into an electric lamp by adding adding electric cables. Also the three small lamp shades of red glas are newly added. If I want, he said, I can have it for my bed room. Of course, I want! It would go along well with the red in the floor tiles. I am looking forward to see a picture of the chandelier hanging from the ceiling in our bed room. The pictures above were taken in my parents-in-law home in Calabria and in our house in Pizzo.